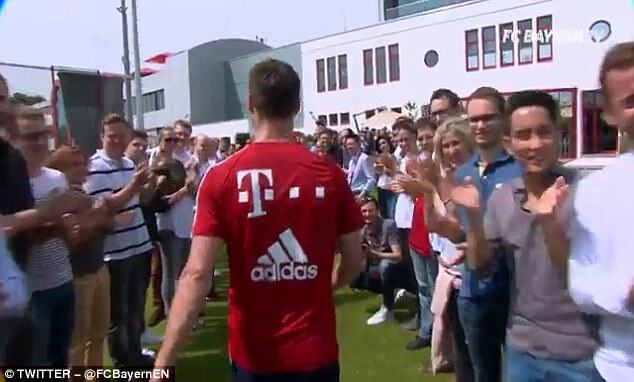 There were emotional scenes at Bayern Munich’s training ground on Friday afternoon, as two of the club’s biggest stars waved goodbye for the final time. 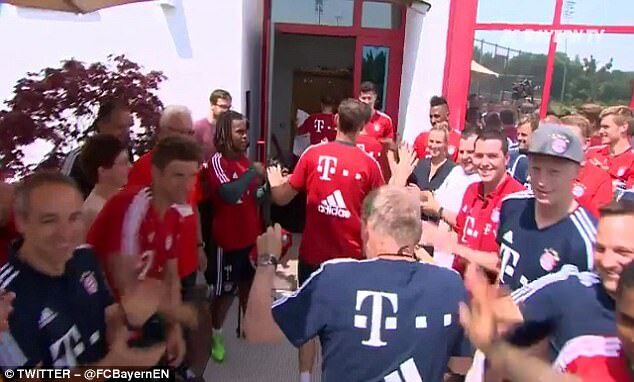 A guard of honour was created for Philipp Lahm and Xabi Alonso, as they headed in from the Sabener Strasse pitch after their last ever training session. Goalkeeper Tom Starke and legendary coach Hermann Gerland were also applauded off, as the club created a special occasion for those saying their farewells. 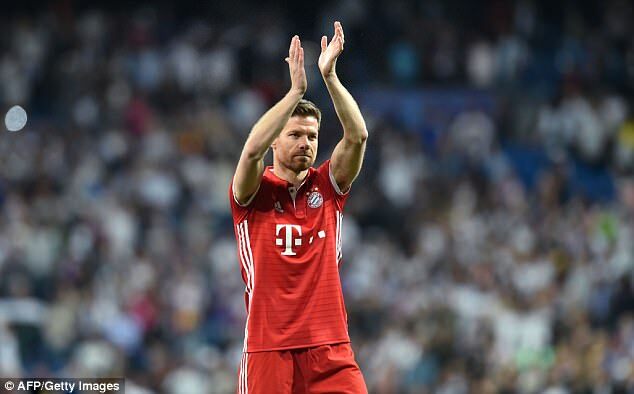 There is still one match to play – an emotional last hurrah for Alonso, Lahm and Starke against Freiburg at the Allianz Arena – but Friday was seen as a way for the club’s staff to thank the departing heroes. Each of the four were given a canvas signed by all members of staff and players, which Lahm and Alonso took some time to read as the entered the building. As the sun shone over Munich, they were applauded off after Carlo Ancelotti had taken them through their last ever training session. 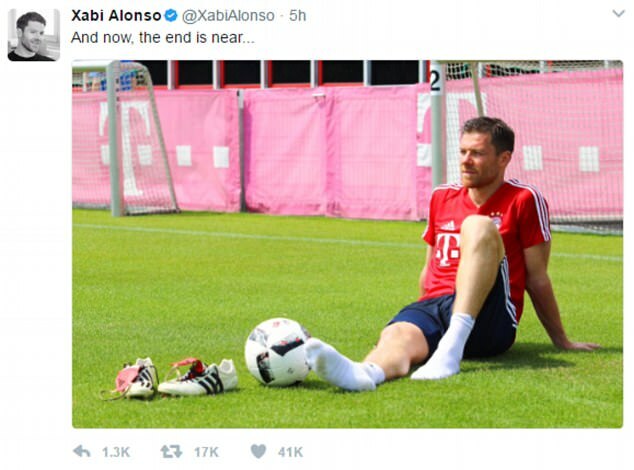 Alonso will have fond memories of his three years in Germany, but it will likely be more emotional for the legendary Lahm, who has been at Bayern since 1995. At the age of 33, he is hanging up his boots, with an eighth Bundesliga winners’ medal about to be collected. Bayern have already eased to the title, blowing away the rest of the league to storm to a 13-point lead ahead of the game. That allows Saturday to be a celebration for the three outgoing players, while assistant manager Gerland will take his place in the dugout for the last time. Goalkeeper Starke will be staying at the club in a non-playing capacity, but he will stand between the sticks at the Allianz for the final time this weekend. He joined in 2012 after a long career with clubs such as Bayer Leverkusen and Hoffenheim, but at the age of 36 has decided to hang up his gloves. The German will now take up the role of goalkeeping coach co-ordinator at the FC Bayern Campus and admits he is delighted with his new position. There were also some kind words reserved for the two star players heading for the exit, as first team coach Ancelotti admitted: ‘It was a very emotional day.